"7 nights for the price of 6". Yes, book 7 nights bed and breakfast at Raddicombe and get the 7th night free. This offer applies throughout the year. So for a week in July that's just £252pp Aug £270pp Sept £228 (all prices quoted include breakfast each morning) Try getting a better deal locally! 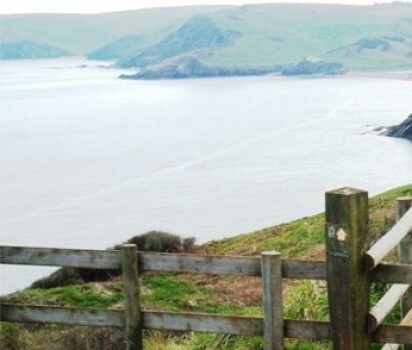 Raddicombe Lodge offers B&B accommodation and is situated in a stunning location midway between Brixham and Kingswear in south Devon with sea views from most rooms. 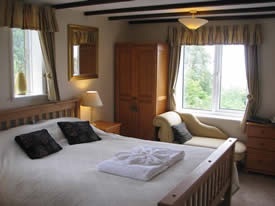 4 star accommodation and recently awarded a breakfast award by Visit Britain (2011 to 2015). 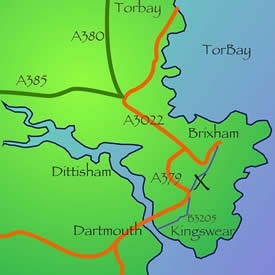 Located close to Kingswear, Dartmouth, Churston, Coleton Fishacre and Greenway House, home of Agatha Christie’s former holiday home. 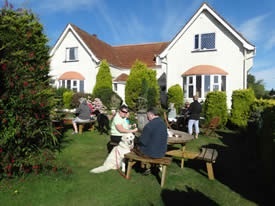 Set in its own grounds, overlooking National Trust land to the sea, with views across Brixham, Lyme Bay and Start Bay. Tucked away in peaceful surroundings in a quiet non main road location yet conveniently situated midway between the picturesque harbour towns of Brixham and Dartmouth and within walking distance of a bar and restaurant in the village of Hillhead. 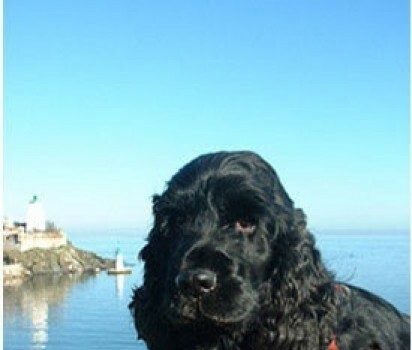 Raddicombe is a dog friendly guesthouse and is located close to the South West Coast Path and the River Dart Trail. We are also just 2 miles from the National Trust property at Coleton Fishacre and just 3 miles from Greenway which is fully open to the public. Raddicombe offers 4 star accommodation, first class service, en-suite rooms with Free Wi-Fi access, PRIVATE CAR PARK for all guests is located at the rear of Raddicombe Lodge, which is a bonus for B&B’s in this area! 4 Star quality accommodation at an affordable price. 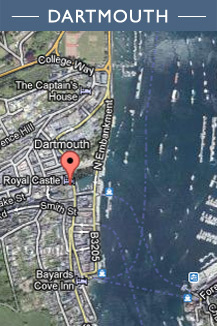 We have a very nice bar and restaurant within walking distance of Raddicombe. Nico's is situated at the Hillhead Caravan Club site, just 10 minutes walk. 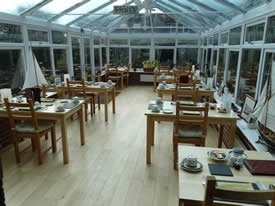 Our award winning breakfasts are served in our conservatory dining room and are freshly cooked to order. Most products are sourced locally including farm eggs, bacon and sausages. Your hosts Kay & Graham are on hand to help with any aspect of your holiday, from suggested walks to advice about boat trips and places to visit in the area.....nothing is too much trouble and their pleasure is derived from making your stay at Raddicombe an experience to remember. We are passionate about personal attention and detail. "Another perfect stay with wonderful hosts...it was good to be back"
Linda and Richard plus katie the dog. "Loved every minute of it. Food, room, hospitality all fantastic. Thank you". Jayne, Gary, Megan and Darcy the dog. Lovely room...fantastic view, pleasant stay". Paul, Sue, Poppy & Piddles the dogs. 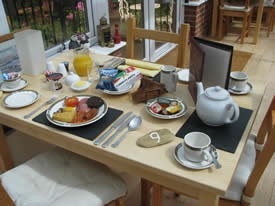 "Well deserved 4 star certificate - Wonderful breakfast". Mr & Mrs Thorley. Stoke on Trent. "Very pleasant people to be with. Would certainly come back here again. Thank you both very much". Kay and Geoff Berridge. Bilston West Mids. "Came last year - Great! Phil and Lyn. Chard Somerset. "Unlike most B&B's in Brixham which seem to be on a busy road leading into the town, Raddicombe is in a peaceful, relaxing area of the town with NO traffic noise. We have found a gem and have very much enjoyed our stay......Especially the breakfasts. We stayed in room 7". "This is our 3rd visit to Raddicombe and once again made most welcome. Graham and Kay's attention to detail is first rate. We will be coming back in September for another 4 nights stay...Thank you"